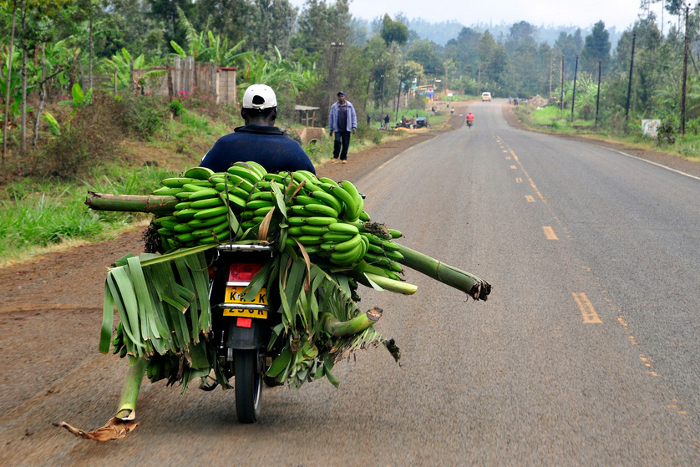 A farmer transports bananas to market by bicycle in Uganda. 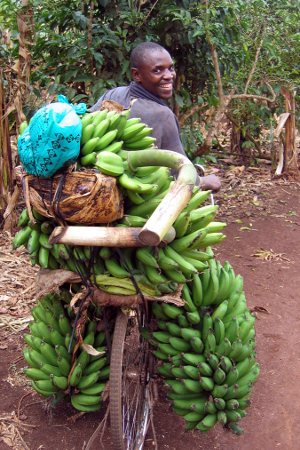 At whatever time of the day or night you are reading this, somewhere in the world there are sure to be farmers trekking many kilometres to take their bananas to local markets. These small-scale farmers produce almost 90 percent of the world’s bananas, and make up a significant portion of the 400 million people around the globe’s tropical girdle – Africa, Asia and Latin America – who rely on bananas for food and a source of income. Bananas are often called the world’s most popular fruit, and global production in 2012 was almost 140 million tonnes. India is the largest producer, while South and Central American farmers supply the most to international supermarket shelves, exporting 80 percent of their bananas. 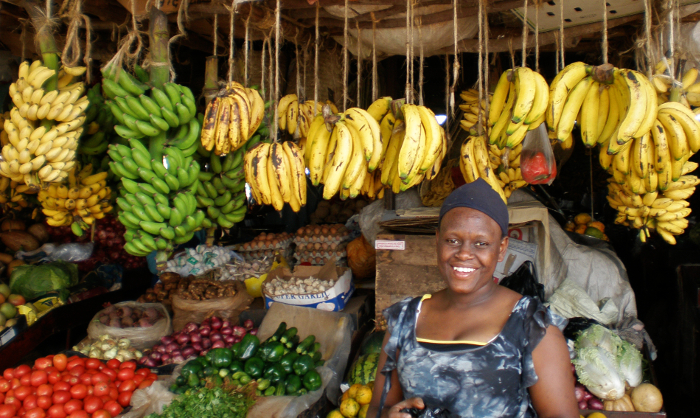 The importance of the banana as a food crop in tropical areas cannot be underestimated. More than a simple snack, plantain-type bananas in particular are a key component in savoury dishes. In Central and East African countries – like Cameroon, Gabon, Rwanda and Uganda – one person will eat an average of between 100 kg and 250 kg of banana each year. That equates to somewhere between 800 and 2000 average-sized bananas. In those four countries, bananas account for up to a quarter of people’s daily calorie intake. A stallholder offers bananas for sale at a fruit market in Nairobi, Kenya. Banana propagates though asexual reproduction. This means that all the bananas of each variety are genetically identical, or nearly so, and therefore susceptible to the same diseases. Indeed, the world has already lost almost its entire banana crop once: before the 1950s, the Gros Michel cultivar dominated banana exports, but it was gradually wiped out in most regions by Panama disease, caused by the fungus Fusarium oxysporum. Furthermore, with reproduction being asexual, it is difficult to develop new, resistant varieties through conventional breeding. At the turn of the twenty-first century, pests and diseases were once again becoming a real threat to global banana production. Little genetic research had been done on the fruit, and only a small portion of its genes had been used in breeding new varieties in its 7,000-year history as a cultivated crop. “Several research groups had developed genetic markers for bananas [‘flags’ on the genome that can be linked to physical traits], but there was no coordination and only sketchy germplasm studies,” recalls Jean Christophe Glaszmann from CIRAD (Centre de coopération internationale en recherche agronomique pour le développement; Agricultural Research for Development) in France. 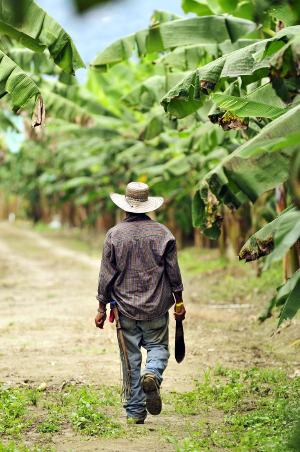 A plantain farmer walks through a plantation in Quindió, Colombia. “It was not a priority,” says Jean Christophe, who was Subprogramme Leader for Genetic Diversity for the CGIAR Generation Challenge Programme (GCP), an international initiative established in 2004 to encourage the use of genetic diversity and advanced plant science to improve crops. But between 2004 and 2012, under GCP, a wealth of research work was undertaken that culminated in the complete genetic sequencing of banana. It was a long process, says Jean Christophe, but the GCP-funded work on banana made a significant contribution to important results. The extensive data on the genetics of banana are now available to scientists worldwide, who can use it to delve deeper into banana’s genes to breed varieties that can sustain the poorer populations in developing countries. 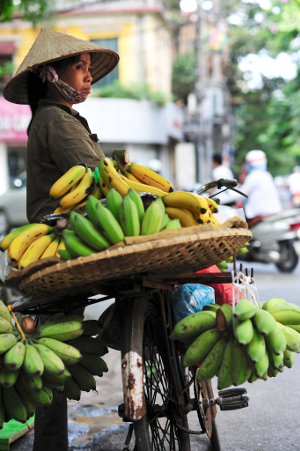 A banana seller in Hanoi, Vietnam. Plans to sequence the banana genome started taking shape in 2001 at Bioversity International (a CGIAR centre), where a group of scientists formed the Global Musa Genomics Consortium. At that time, the only plant whose genome had been sequenced was Arabidopsis thaliana (a small flowering plant related to cabbage and mustard, used as a model organism in plant science), with rice close behind. Hei acknowledges that banana was ‘somewhat on the fringe’ of GCP’s main focus on improving drought tolerance in crops. However, he says, it was still relevant for GCP to support the emergence of improved genetics for banana. “The work we did in genetic diversity is about future generations. We wanted a programme that is pro-poor, meaning that the majority of the people in the world are depending on [the crop]. 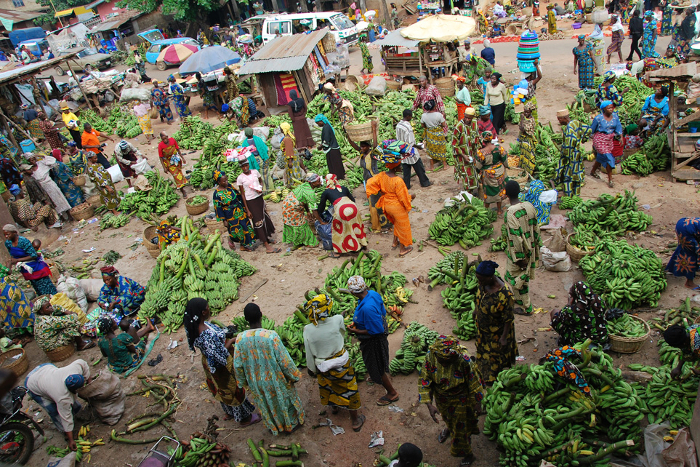 A typical banana and plantain market at Ikire in Osun State, Nigeria. “Drought tolerance is a good candidate because drought affects a lot of poor areas, but you really cannot just take one trait as pro-poor. We had a highly motivated group of researchers willing to devote their efforts to Musa,” says Hei. The resultant research team was led by Japan’s National Institute of Agrobiological Sciences, which had vast experience in rice genome sequencing. “So, living up to its name as a Challenge Programme, GCP decided to take the gamble on banana genomics and help it fly,” says Hei. Banana bunches on an experimental plot at IITA. 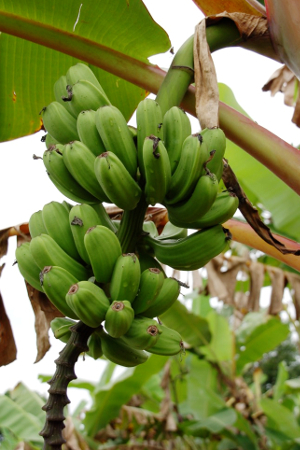 Three global research agencies were charged with working together to develop a reference set for banana: Bioversity International, CIRAD, and the International Institute of Tropical Agriculture (IITA). Creating a reference set – a careful, tactical selection representing the genetic diversity of a crop – is an invaluable first step in enabling scientists to work together to develop more ‘intelligent’ genetic data. “Initially, we put together a community of institutions that have collections [of banana germplasm],” explains Jean Christophe. “And then we put together these initial materials that we sample in order to develop representative subsamples – this is called a ‘composite’ set because it comes from different institutions. So, in the case of crops with an extensive genetic resource base, such as rice, there may be more than 100,000 different plant samples, or accessions, that are reduced to a few thousand. For banana, which has a smaller genetic resource base, a few hundred thousand accessions can be reduced to a few dozen. “A couple of hundred accessions or fewer become manageable for plant breeders or crop specialists. And we want this to serve as a reference, shared among people, so that everybody works on the same reference material,” says Jean Christophe. “We analysed about 500 accessions and narrowed it down to 50,” says Jean Christophe. This reference collection is currently stored at the University of Leuven in Belgium. The refined data collected on the banana reference set enabled the researchers to unravel the origin and genealogy of the most important dessert banana: the Cavendish, the cultivar subgroup that dominates banana exports worldwide. Thanks to the early GCP work, they were able to show that Cavendish bananas evolved from three markedly different subspecies. 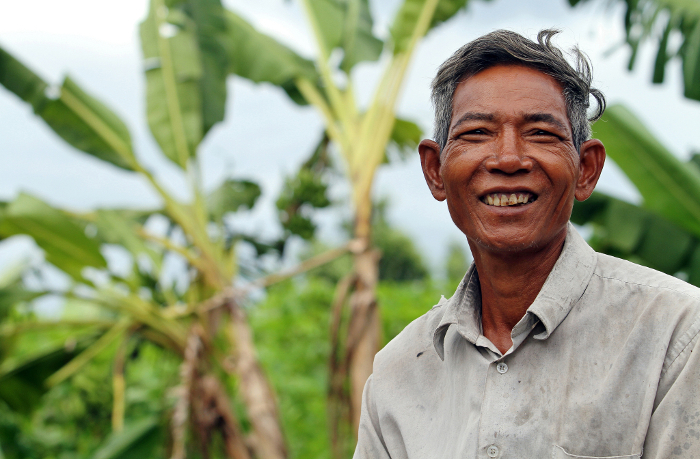 65-year-old Cambodian farmer, Khout Sorn, stands in front of his banana trees in Aphiwat Village, Tipo commune, Cambodia. During these preliminary years of GCP-supported research on banana, the Programme funded several other smaller projects to consolidate genomic resources available for banana. Scientists developed libraries of artificial chromosomes that can be used in sequencing the DNA of banana, as well as genetic maps, which according to Jean Christophe are essential for improving the quality of the sequence. These projects contributed to the full genome sequencing of a wild banana from Malaysia’s Pahang province in 2008. The ‘Pahang’ subspecies is one of the Cavendish variety’s three ancestors, and has also been shown to have had a role in the origin of many other banana cultivars, including those that are most important for food and economic security. 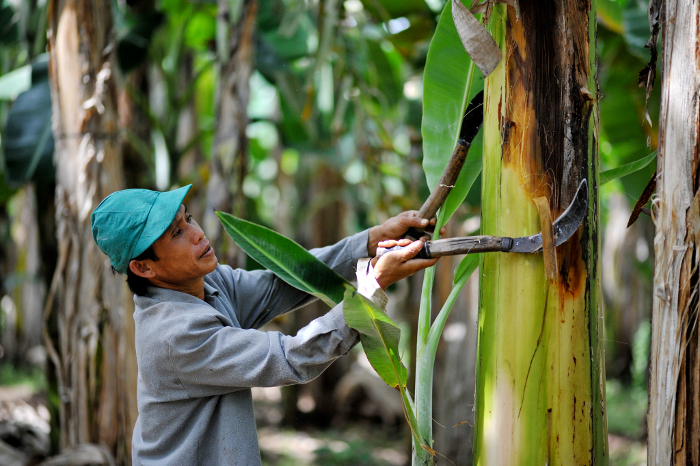 A farmer at work on a banana plantation, Mindanao, the Philippines. 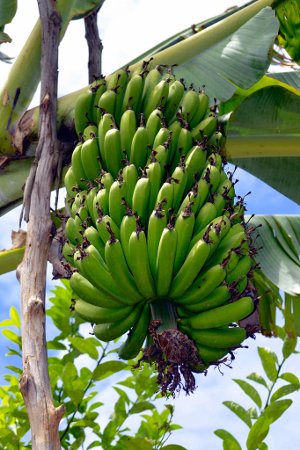 The more that is known about the genes responsible for disease resistance and other desirable traits in banana, the more researchers will be able to help farmers in developing countries to improve their yields. “The road remains long, but now we have a good understanding of genetic diversity,” says Jean Christophe. “We have done a range of studies aimed at unravelling the genes that could control sterility in the species. “This is undoubtedly an inspiring challenge towards unlocking the genetic diversity in this crop. “If we have more money in the future, we are going to sequence others of the subspecies so that we can have the full coverage of the current Cavendish genome. But that was a good start,” says Jean Christophe. The new intelligence on banana genetics has given breeders the material they need that will ultimately help 400 million people in the tropics sustain food supplies and livelihoods. Bananas on the way to market in Kenya.